As the only veteran who will ever have his teammates’ back — especially in situations when a prima donna slips — Rajon Rondo may be more valuable going forward past the trade deadline. Unlike most Bulls fans, I love Rajon Rondo. He isn’t at par with most point guard possibilities for the Bulls, but he works perfectly for a pace-and-space system like Hoiball. In spite of what the numbers say about him on defense and his idiosyncratic playmaking, he is the playmaker who gives up shots in favor of getting his teammate a score, even when he is unguarded in front of the rim. With his game bogging down with the two other “Alphas” as a starter, Rondo was benched for a while and spoke with a few different people among the organization to help clear the air. After Fred Hoiberg spoke with Rondo, he reinserted him into the second unit and good results followed shortly after. Rondo plays on the fast break really well and he can drive with a change-of-pace motor that can dupe defenders to leave him open for his hook layup or free a teammate with a clear path to the basket; something Nikola Mirotic benefits greatly from because only Rondo passes to him as when he dives. 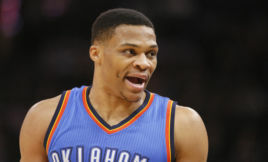 He sometimes showboats with a fake pump behind-the-back feint in which he can swing into a layup. During his time with the Sacramento Kings, he made them look better as a whole with their best bench players in Ben McLemore and Willie Cauley-Stein attacking the rim and running the floor. 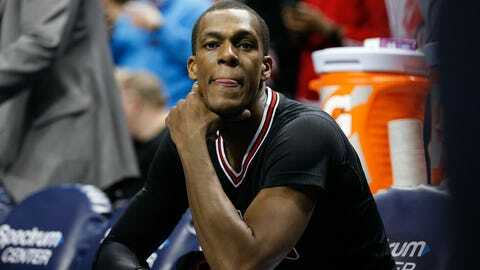 Rondo’s positive influence with the younger Bulls players is well-known and K.C. Johnson of the Chicago Tribune recently talked to some of the Bulls’ second unit players like Nikola Mirotic to Jerian Grant, who all swore Rondo is their older brother teammate who looks out for them. There actually may be no other point guard right now to fit the bill for the Chicago Bulls after the people they’ve cycled for the position: Derrick Rose (2011 NBA MVP), Justin Holiday (NBA Champion with Golden State, solid backup defensive PG), Michael Carter-Williams (2013 NBA Rookie of the Year award), Jerian Grant and Isaiah Canaan. All these guys can be devastating in their own style of play and have shown their fit in Chicago, but it is Rajon Rondo who allows the traditional Fred Hoiberg lineup of one playmaker and four shooters to work like magic. When the two Marquette Alphas bog down on offense, it’s Rajon Rondo who helps Doug McDermott 20 points in one quarter (probably 20 more in the third if he started the second half). It’s Rajon Rondo who makes Doug McDermott, Mirotic, Paul Zipser and Cristiano Felicio a unit that the Bulls can race out to good leads with against other teams. If Jimmy Butler is angry when the Bulls lose close games and wants to play with people who care, he need look no farther than Rajon Rondo. When the team loses, they just build up to a stronger game the next with Rondo running the young squad. Every game the young Bulls get under their belt having a ball and playing free gets them into better shape for a possible playoff run. Ignore all the doomsayers who say that the Atlanta Hawks are a tough matchup, or that the Toronto Raptors might get stronger, or even that the Cleveland Cavaliers are unbeatable. Gar Forman would be hard-pressed to find anyone else like Rondo, in spite of benching him after misreading the analytics instead of trusting the eye test. One playmaker. Four shooters. Hoiball. If Butler and Dwyane Wade can keep their egos in check and help the team get 29 assists like they did against the Philadelphia 76ers recently, and play tougher defensively from now until April, the Bulls don’t have to move anybody. They’re currently seventh in the East right now, so there’s a chance Butler and Wade can just sit back and enjoy an easier ride than play hero-ball and gas themselves out with fat stats and a trade-off in losses. Test the young squad and be glad they don’t lose Rondo as easily as they lost Justin Holiday this past summer. Rondo is the stud playmaker for a run-and-gun Bulls roster of the future and a mentor to the young guards on the team, and someone whom Michael Carter-Williams, Jerian Grant and Denzel Valentine can learn from. Next: The Bulls are going on a (long) road trip? I’d like to see a Chicago Bulls team that scores 38 a quarter again and blow bad teams out by 20 to 30 points. Let’s see that team play for the rest of the year with Rondo leading the charge.